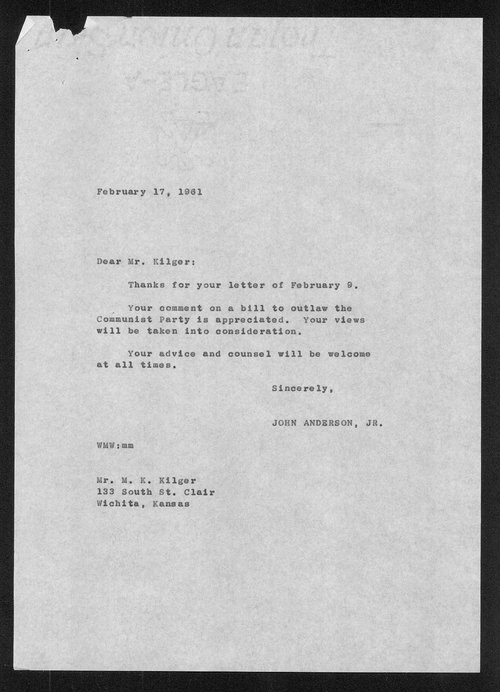 Republican politician John Anderson complied this series of correspondence on communist issues from letters received while governor of Kansas from 1961-1965. Anderson's tenure in office was in the early 1960s and one of the signs of the times was the perceived threat of the Soviet Union and the Cold War in international politics. Ordinary Kansans felt this threat and called upon the governor to do everything in his power to halt the spread of Soviet communism. The communist party had, in fact, been outlawed in other states (Arizona and Arkansas, for example). Of all of the issues of the time, the threat of Soviet expansion and spread of communism probably caused more anxiety and fear than any other. The letters from individual Kansans and organizations such as the Veterans and Citizens Committee Against Communism and the National Indignation Convention reveal a level of anxiety bordering on paranoia.